Since moving to the US, the single item that I’ve missed most in the kitchen is the gas stove. After eight months of getting used to an electric stove, I can cook most dishes on a flat skillet without any problem, including fried rice and noodle dishes that requires high heat. The results were so good that I even started to think that I probably didn’t need a gas stove, after all. 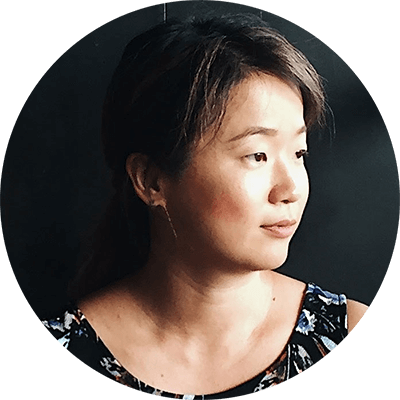 On the other hand, I’ve constantly received readers’ requests to learn how to use a wok. This posed a problem for me. 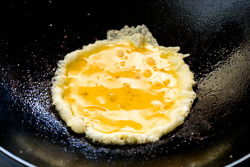 After many attempts at wok cooking on our slow-heating electric stove, I gave up completely. It simply wouldn’t generate enough heat to make a stir fried dish work. That is, unless I waited patiently for my cast iron wok to heat up – for 15 minutes or longer. Which kind of defeated the purpose of a quick stir fry. Luckily, I found a solution – a portable gas stove with a cast iron wok. I cooked a basic shrimp fried rice the other day using my new setup. It took me 30 seconds to get used to the gas stove again. Then I enjoyed the process. The rhythmic clang of the spatula and the sizzle of the greens were music to my ears. I wanted to dance in the kitchen. 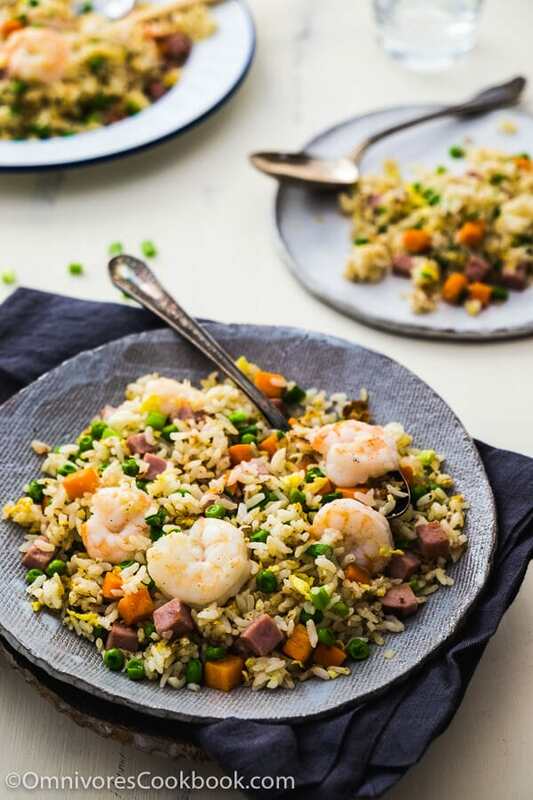 Just like the good ol’ days, a perfectly cooked shrimp fried rice was finished in under 3 minutes (yep, I timed it), including heating up the wok. The grains of rice were well separated and slightly charred. The vegetables were crispy, with beautiful color. And the shrimp were seared until just cooked through. Still tender and moist. Plus, everything stayed in the pan, with no messy stovetop. How delightful! It was so great to pick up the wok again, that I made a video to record how easy it is to cook this dish. Enjoy! 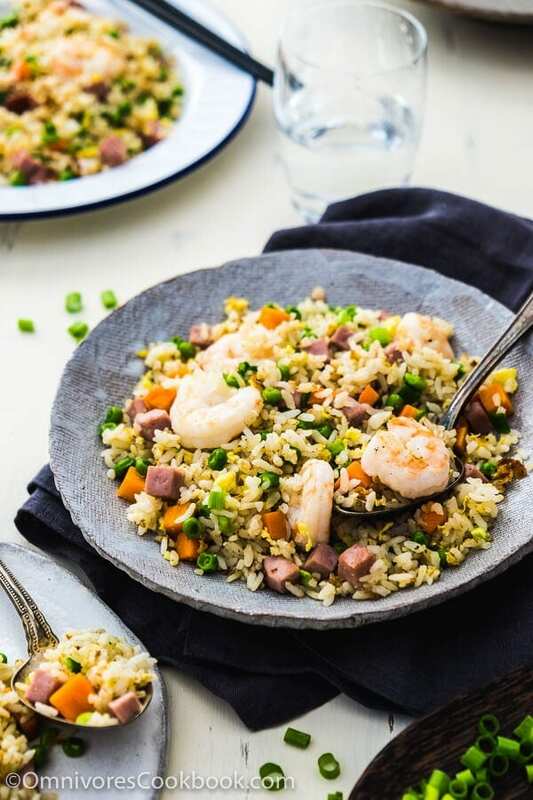 No matter whether you’re using a skillet or a wok, you can use this recipe without any problem. Either way, don’t forget the key to cooking stir-fry: always gather all the ingredients near the stove before turning on the heat. This way, nothing will be overcooked, and it will save a lot of anxiety during cooking. 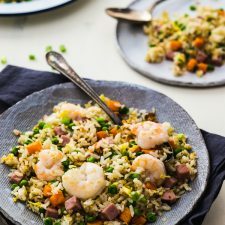 Looking for more stir fried rice recipes? 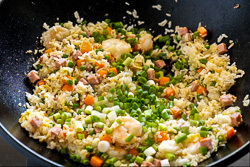 Check out Chinese Olive Fried Rice, Hoisin Sauce Fried Rice, Soy Sauce Fried Rice, Chicken Fried Rice, Kimchi Fried Rice, Jambalaya Fried Rice, and Mongolian Beef Fried Rice. Prepare all the ingredients and a large empty plate. Place them near the stove. 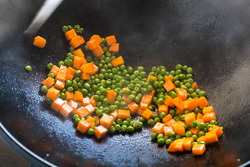 Heat 2 teaspoons of oil in a wok or a nonstick skillet over medium high heat until hot. Swirl to coat the bottom of the pan with oil. 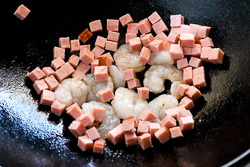 Add ham and shrimp. Cook for 30 seconds without disturbing. Stir and cook until the shrimp turn white. 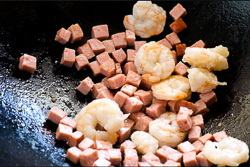 Immediately transfer the ham and shrimp to a separate plate. The shrimp should be just cooked through, or slightly raw in the center. Add 1 teaspoon of oil. 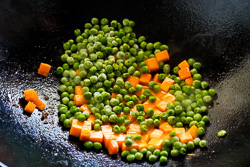 Add carrot, green peas, and a pinch of salt. Cook and stir until they start to turn soft. Transfer to the plate with the shrimp. If the pan starts to get too hot, turn to medium heat. You should hear vibrant sizzling throughout the cooking, but the pan shouldn’t be so hot as to burn the ingredients. Add the remaining 1 tablespoon of oil. 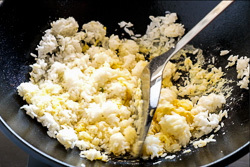 Add egg and quickly stir a few times. Add rice. Cook and chop to separate rice. 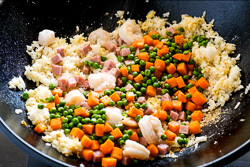 Return the cooked shrimp, ham, and vegetables to the wok. 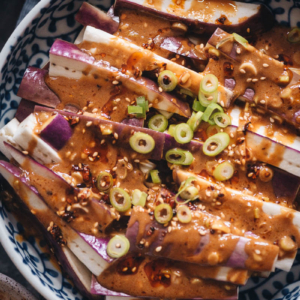 Sprinkle salt and white pepper, and swirl in light soy sauce. Immediately stir to mix well. Add green onion. Cook until the rice is heated through and the grains separated. Turn to low heat, carefully taste the rice and adjust seasoning if necessary. Transfer to plates and serve warm. I used SizzleFish Wild Caught Gulf Shrimp in this recipe. The shrimps are very fresh, so I didn't need to marinate them before cooking. 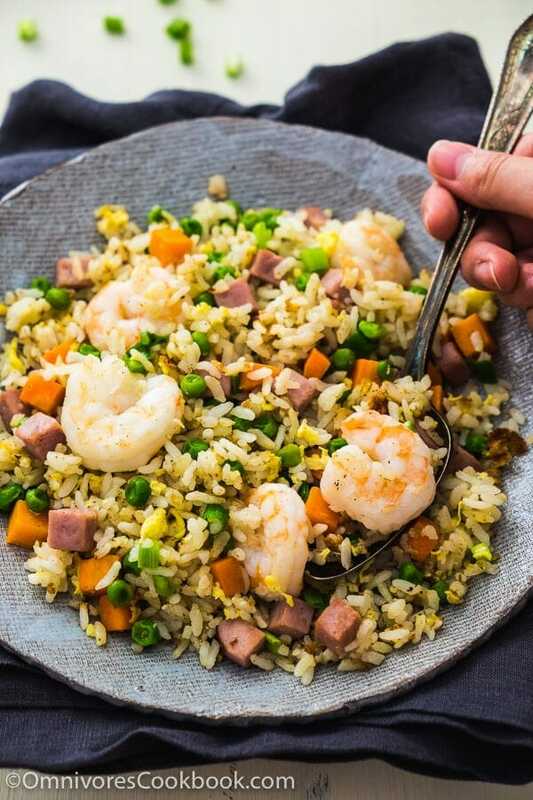 If your shrimp is not extremely fresh, add 1 teaspoon cooking wine (Shaoxing wine or rice wine) and a pinch of salt, and let marinate for 5 minutes before cooking. Looks absolutely delicious! I cooked on an electric stove for many years and finally got a gas stove a couple of years ago. Love using my wok now 🙂 Will definitely try this dish in it. I have the same problem with electric stoves. I’ve had gas for years but my daughter has electric and it’s just not the same. I love your solution though and the fried rice looks amazing. It’s so great too to have such a great video to really see how easy it is. Thanks Maggie! I have an electric and it drives me nuts. I have a gas stove out west and I miss it so much! I absolutely love this dish, Maggie, and love your videos. They are inspiring! I have missed my gas stove for years and always wanted another. It is so expensive to run the gas line it’s just not worth it. 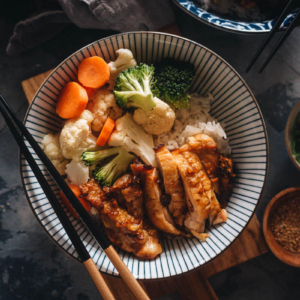 Anyway – love this dish – it looks wonderful and I bet it did feel good to be able to stir fry with the right equipment. Thanks! I have been cooking on an electric stove for 60 years. No problems with the shrimp fried rice recipe which turned out great. Very tasty and light. I didn’t have shrimp and substituted steamed cod which I broke into pieces after it cooled a bit. I think a lot of substitutions are possible with this recipe. The result will in most cases be good. Thank You for the detail you put into the recipes, it makes it so easy to make. Thank You Again! Can you make this using frozen vegetables? Does that change the order of cooking? Hi Michelle, yes, you can use the frozen vegetables and the order of cooking doesn’t change. 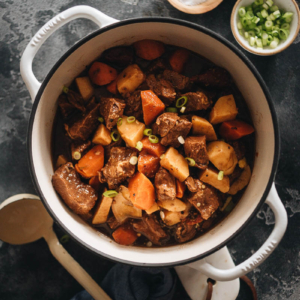 I found your website via Nagi recipe tin eats who was singing your praises. nice to have found you.